The World Wide Web is 30 today (11 March 2019). 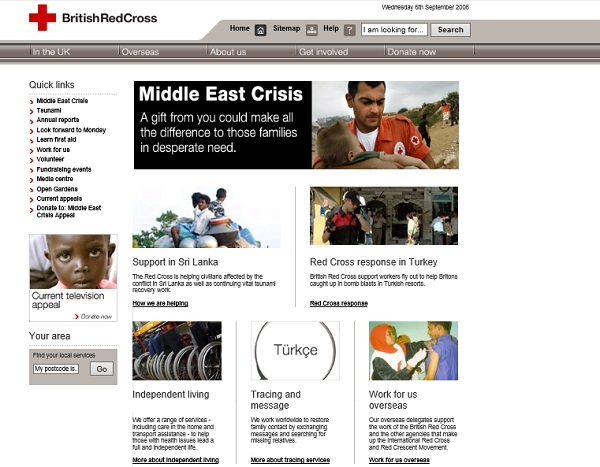 Five years ago I used the Wayback Machine to look at trends in charity website design, using British Red Cross as an example. Here is the post, now updated with lessons from 2019. Is your charity website keeping up with the latest developments in design and functionality? 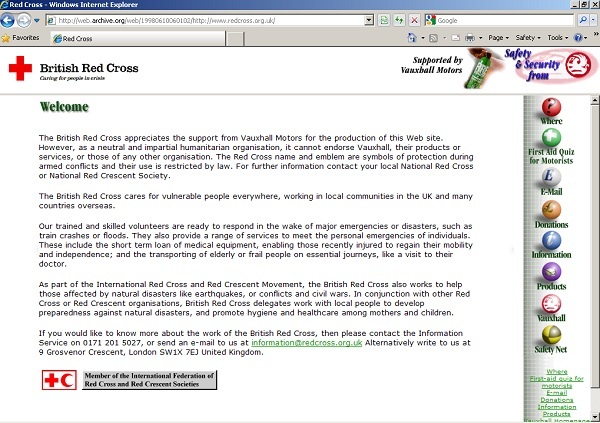 The British Red Cross homepage in 1998 shows that the web standard of logo in top-left was there from the start. The site was very basic, probably hand-coded in html and uploaded via FTP. Brochure-ware content – dense homepage to be read like a book. Email to make a donation. Approx 10 pages. Only one-level down. Another eight years and now the 2014 website still leads with an appeal using a single emotive image. The site is sophisticated offering many opportunities for interaction, transaction, discussion and commerce but also has a presence across many other digital platforms (YouTube, Facebook, Twitter, blog, Apps, games etc). It feels like digital is now being taken more seriously. Multiple channels (links to six network channels at the bottom of the page). Optimised for mobile / tablet. Now the 2019 homepage is all about clarity and impact. Previously the homepage would have had to work hard at promoting everything as most people would go to the homepage first. Now sites are so well indexed with people going direct to the pages they are looking for, so the homepage can be devoted to telling a story or running a campaign. The homepage can appeal to hearts and minds rather than acting as a directory. The currently site uses a full-screen video for the current appeal. It shows 10 seconds of different views from Yemen to tell a story to drive donations. Below the appeal, the page is segmented into sections with different types of links (UK appeals, get help in a crisis, support, first aid, how we help, shop). These use colour and photos to make it easy to use. This architecture is replicated in the top-level navigation which is now reduced to five options. Images are more powerful, instantly telling a story. Video is centre-stage. Simplified navigation (no more What we do, Where we work etc). Language is shorter and has more impact. Links are 1-3 words. Appeal text is ‘Help give life-saving aid to families in desperate need’. In contrast with ‘Help us continue giving thousands of people vital aid in this desperate situation. Please give what you can today’ from 2014. Donate button on top right-hand side. I have been training people on writing for the web since 2003 – over half of the web’s life – and working on websites since 1996. Many of the old rules still apply (short sentences, headings, meaningful link text etc). But the way we consume information and content online in 2019 means that we now need to be even tighter with our words. Attention spans are shorter and screens are smaller. The language we use needs to be immediate, strong and clear. There is no room for wasteful words on the homepage or in navigation links. Photographs and images now need to have more impact. They should use strong colours and instantly tell a story. Compare the images used in 2006 / 2014 with the images used now. They use close-ups and are not afraid of sharing an intimate moment, pain or emotion. They are beautiful and difficult to look at. You don’t need to be the size of British Red Cross to need a clear plan for how your website and wider digital platforms support the goals of your organisation. Technologies and design standards are changing all the time. Just today, Samaritans launched its new website which has a cool features such as a dynamic homepage which changes depending on the time of day. A digital strategy can help you to persuade trustees to invest in new technology or staff. You may use it to plan your increasing use of social media, create digital services and have a reference for how you’ll deal with a crisis. Or it may help you plan the next 6-12 months, ensuring you are using your resources in the right way and keeping up with your peers. Take a look at the Charity Digital Code of Practice which was launched at the end of 2018. It aims to help charities increase their impact, develop skills and improve digital sustainability. Zoe Amar recently shared data from the self-assessment tool to show where charities are at with Code. Whatever the priorities for your website, it is worth investing your time in producing a digital strategy to support its future evolution. Building a digital workforce – NCVO tool. CAST’s 10 design principles for better digital design. If you need in-person help, there are lots of Digital Strategy courses and freelancers / consultants who can support you. We can get the web we want – Tim Berners-Lee in The Guardian. Look at other examples of how design has evolved via the web design museum. It’s that time of year again. Rather than spending money on plastic tat / novelty socks, why not use some or all of your Secret Santa in a more impactful way? Here are a few examples of charities running Secret Santa sized fundraising campaigns and other ideas for doing good within your budget. Give the gift of reading – make a donation to Beanstalk + give a book you already love to your Secret Santa. Surprise a child with a book through Book Trust’s annual campaign. Be a Secret Santa with Action for Children. Help light up the map. Don’t festivalFail. Order a letter from Santa via NSPCC. The Charity Retail Association is encouraging everyone to be a #GoodCauseSantaClaus and buy gifts from charity shops. Oxfam’s online charity shop is an amazing treasure trove of unique items if you are looking for a gift. From used football stamps to vintage knitting patterns, a jigsaw of the Queen Mother, and GoggleBox board game, there’s something for everyone. You can search by price to fit your budget. Many charities run virtual gift packages. For example Oxfam Unwrapped gifts start at £5. Social Enterprise UK say #BuySocial and get #PresentsWithPurpose. Check out their Christmas catalogue. Use the Giving Machine’s Secret Santa generator to pick names and buy gifts. Why not pool your funds and do something bigger as a team? Reserve someone a place at Crisis at Christmas for £28.18. Is there a Christmas Dinner for care leavers or older people near you? Could you buy something from their wishlist? Here’s Hackney’s Christmas Dinner (part of a programme of 17 Christmas Dinners for care leavers across the country, donate to their crowdfunder) and John Popham’s Connected Christmas campaign for older people. Set a place for a child at Mary’s Meals virtual Christmas dinner table for £13.90. Buy a safety kit or actual bike for a refugee via The Bike Project. Is there a local toy collection you could contribute to? There are countless fundraising appeals, Christmas jumper days and local food bank collections you could instead donate to in the name of your Secret Santa. Leave Relf on the shelf and give a gift that matters say International Rescue Committee in this fab video. Do you do Secret Santa in your team? Any tips? Is your charity doing an interesting appeal? Highlights this month: big hashtags, user-generated content, AI, voice tech, digital skills and more…. The nights are setting in and seasonal content is upon us. October is a very busy month of awareness days. There was lots of great content launched. Pop the kettle on and catch up. 10 October was #WorldMentalHealthDay, #WorldHomelessnessDay and #HousingDay. I have never seen my list of trending topics look like this for an hour, let alone all day. The trending hashtags and topics were consistently related to these issues. Nothing else got a look-in all day. A powerful poem from Crisis for #WorldHomelessnessDay. 22 local charities donated their HOMEpages to homelessness charity St Basils in the West Midlands to raise awareness. Did you see Time to Change’s new #AskTwice video? And their Moment of user-generated content – these are the reasons people say ‘I am fine’ when they’re not. Love these prompt cards from Young Minds. Mental Health UK produced beautiful images to illustrate people’s stories in their Let’s Talk series. See Nathaniel’s story. Plan International UK launched a video about sexual harassment. It has had 94k likes and over 7 million views. Check your breasts video from Breast Cancer Now. Love this promo for the Charity Comms podcast. Parkinson’s UK launched their list of approved apps and devices for people with Parkinson’s. A charity first. It was RNIB’s 150th birthday. This is how to promote a new area in a museum. Top video from Eureka! Museum. SCVO’s what is modern charity video. The warning signs of genocide, powerful video from RightsInfo. Choose your own next line for #NationalPoetyDay. Great use of a thread / polls by the Museum of English Rural Life. Charities don’t usually tweet on a Sunday night. I liked this moment to paws from RSPCA. There was some great halloween content around. Twitter takeover of the month: CoppaFeel’s Kris Hallenger / @nhs. Kris who has been living with stage 4 breast cancer since 2009, talked about treatments and good health. This excerpt from Clic Sargent’s impact report was widely shared and celebrated as a great example of transparency. Could your charity do something similar to show what didn’t work? What if we scrapped the annual report and started again? asks David Ainsworth in Civil Society. Why do we ignore digital impact? Matt Haworth asks why the impact of digital services isn’t included in impact reports. Thread about the future of advertising by Nik Sharma. FRIENDS IMPACT: A tongue-in-cheek shoplifting appeal led to 50 per cent of Blackpool people thinking better of their police by Dan Slee. Does your search strategy match how people expect content? Think about the Netflix effect say The Royal Academy. If you missed Being the Story, here’s my blog post about it and links to others’. Will you join in with #YouMadeItHappen on 19 November? Find out about this new day, led by NCVO. >> I’ve written a blog post with some ideas about how to get involved with #YouMadeItHappen. Internet-era ways of working by Tom Loosemore of Public Digital. 6 tough questions third sector organisations need to explore in a digital age from SCVO’s digital team. Linking to their ‘what next’ report. Digital is growing up, is your charity maturing with it? (Spoiler: probably not!) by Anya Pearson, Contentious. Digital strategy: The four fights you have to win from McKinsey. 15 principles of good service design by GDS for Digital Leaders. Why Amazon, Alexa and #TechforGood can’t be in the same sentence by James Mullarkey. Five ways to engage with responsible technology by Sam Brown. How Cancer Research UK is exploring AI and voice tech in Charity Digital News. Welcome to the Golden Age of Data – examples from a brave new world of personalisation – NSPCC’s Digital Dunk. Dealing with digital changes – useful tips about keeping up with platform changes and changing tack if needed, by Montfort. Blockchain: the next radical change for charities by Stromi for Digital Dunk. How to create a great charity website experience, case study from MS Society on Charity Digital News. Digital user tests which are easy, fast and affordable – YoYo Design for CharityComms. 4 user research guides from co-op digital. Monthly accessibility tip: RNIB shared 10 #DigitalAccessibilityTips including this one about colour contrast. And if you have never heard a screen reader, here’s an example of how they read image descriptions from Dr Amit Patel. See more about access tech in this Moment of his Twitter takeover for Scope. Did you join in with the first ever Gift Aid Awareness Day? Digital fundraising trends for small charities not to miss by Charity Digital News. Putting fun into contactless donating at two historic sites in Scotland. Tap the past to preserve the future. Hospice fundraisers tend to go the extra mile, like 10-year old Harriet who played her cello at the top of a mountain for Compton Care. Are you ready for #GivingTuesday on 27 November? Here’s a guide to using the day to say thank you. How we teach digital skills at PwC for Harvard Business Review. 3 steps to growing a digital culture – Clive Gardiner of NSPCC shares what they are doing. Three amazing Ted Talks for charities by Kirsty Marrins for Lightful. Critical lessons for charity trustees by Beth Clarke for CAF. The Association of Chairs asked Chairs to share their top tips to mark their 5th birthday. Here are the best ones in a Moment: tips for effective chairing. Feeling helpless about the state of the world? Here’s a thread about the little things we can all do to make things better. A thread of perceptual illusions to mess with your brain. Have you ever looked for treasure in the Thames (or any other urban river)? An otter eating – happy noises! Did you miss September’s round-up? Catch up with more good reads! In the month that we were all swamped in GDPR emails and RNLI and Dog’s Trust were responding to endless negative comments following misreported press stories, there were lots of great reads. Pull up a comfy chair and catch up with some great charity content and digital reads you might have missed from May 2018. Warning – you may need longer than a tea break to catch up. Pick and choose links to read, or open in new tabs for later. Or bookmark this post. Even better, subscribe and get future round-ups direct to your inbox. Enjoy! Build the right thing in the right way – 10 design principles to help charities build better digital services by CAST. Super useful conversation menu produced by CAST. Use these prompt questions when starting digital projects. A guide to agile communication by Giles Turnball. Have you seen SCVO’s beta Digital Check-up tool? Key findings from the LBG Consumer Digital Index. And the full Consumer Digital Index report 2018. 8 free digital tools for small NGOs – useful list from Thomas Worley at BOND. The highs and lows of social media marketing in 2018 (eConsultancy). 6 steps to create a persona that drives your marketing (Social Media Today). Going digital is bloody difficult by Adam Koszary of MERL. Small charities smashing it with digital – Mandy Johnson blogs for JustGiving. Includes 5 top tips and examples. Research into the impact of health tracking following chemotherapy and about Anthony Nolan’s My Transplant Tracker app. New website from MS Society. New website from Alzheimer’s Society. About the rebrand and new website by Canal and River Trust. New Canal and River Trust website too. Becca Peter’s notes from the Charity Comms Engaging Digital conference. Doing more with less: tips for busy communicators. Slides from the CharityComms seminar. Why your content wants to be bad. Love this post by Jack Garfinkel of Scope about the impact of bad processes. 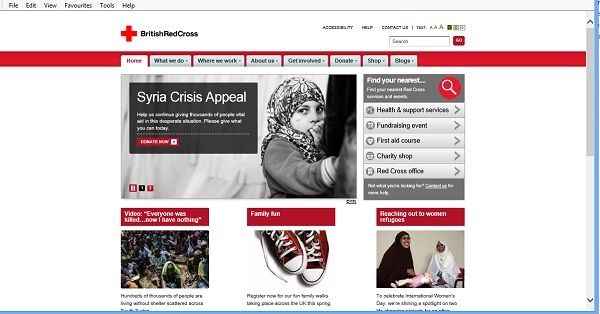 How the British Red Cross revamped its website from 4000 pages to 400 (eConsultancy). How to position your brand as a knowledge centre through content (eConsultancy). Many charity websites are already ‘knowledge centres’ but is your knowledge the type and in the right format for your audience? Are you the go-to for your subject or are your peers or non-charity competitors doing it better? How to spot the passive voice in your writing using monkeys. Simples! Investing in a content strategy leads to better ROI with video. Video content benchmark report by Raw London on Charity Comms. How to write a video brief – tips from video agency Magneto Films. Best practice guide to Facebook by Kirsty Marrins for Lightful. What I learnt about impact in Oxford by Richard Sved. Your monthly reminder to caption your images on social. Talking about poverty in the UK – what works? JRF share a 10-step guide based on research by the FrameWorks Institute. See also this thread from a Universal Credit sufferer which got 4k likes and kick-started some #FoodBankChallenge action. Crisis also worked with FrameWorks to research attitudes to homelessness. Reframing homelessness in the UK (PDF). ICYMI – I updated my 2013 post about trustee / staff pages on charity websites with new best practice and examples. How does your site match up? Charities have a problem with men according to a CAF report (UK Fundraising). Includes questions and a flatpack fundraising guide to address the issues. Handy! The landscape for grantmaking in 2043. Slide share of predictions by Rhodri Davies of CAF. Solo fundraising: how to make it work for your charity – Julia Pitman on CharityComms. A letter to my extroverted boss, from an introvert by executive coach Emma Taggart. Measuring wellbeing – free tools for charity use (UK Fundraising). Why is flexible working not mainstream asks Kirsty Marrins. Similar questions about trust and good management from Kate Brennan-Rhodes in this thread. And this by Madeleine Cassidy on Charity Connect about the mental health of people in the charity sector – The elephant in the room. Stop. CollaboRaise and Listen by Lisa Clavering. If charities really want to be more diverse, then they need to change by Kirsty Weakley in Civil Society. Debunking Maslow’s Hierarchy of Needs (BPS). Results of the ProCopywriters Survey 2018. Some brilliantly inspiring people on this year’s Alternative Rich List. What’s the difference between a healthy brain and one with Alzheimer’s? Engaging video from ARUK. Marine Conservation Society use a shocking image to prompt petition signings about single use plastic. Have we forgotten how to make friends asks the Campaign to End Loneliness. Cheeky Question Time tweet from Shelter. Live scenes of hay fever at Asthma UK. Love the pantone colour matching tweets from National Library of Scotland. NCVO’s nifty animation showing highlights from the Almanac. There was lots of activity for #ChildrensHospiceWeek. Also for #DyingMatters week (though there was no Moment or news round-up to link to, to show you). Instead watch this cute video and song from Dog’s Trust. Plus there was lots of nice content around for the Royal Wedding, such as this knitted couple from Age UK and this blue blood image from NHS Give Blood. This Royal Wedding Moment contains lots of fundraising related fun from large and small charities. Great examples of how to join in with a feel-good event. Strawberry Social even did a comprehensive thread of an A-Z of Royal Wedding tat which should have got more likes than it did. Love this visualisation of the T&C’s of different apps. Nice buttons and dials from Present and Correct. Gammon People (not) by Pulp in a thread. Sick of hearing about the floss but not actually sure what it’s all about? This handy guide by TES for teachers so they can keep up with the kids, is for you! Scan paintings with a new app at the National Gallery. How to build a fly stimulator and annoy little girls. 279k likes for this cool interaction between biker and bus driver. Did you miss April’s round-up? Catch up with more good reads! With more wintery weather heading our way, poke your head out from under the duvet for some of the highlights from March 2018. It has been a bumper month (snow, data abuse, more snow, lots of hashtags) so this round-up has lots of gems. Bullying UK launched an interactive video – your choices change the story. Advice and how to spot the signs of cyberbullying in this video by NSPCC. Time to Change shared another video as part of their #InYourCorner series. The 50 mums | 50 kids video released on World Down’s Syndrome Day has had 3.4m views. 10 things you can do to use water wisely – shared on World Water Day by Eden Rivers Trust in Cumbria. See also this Moment of #WorldWaterDay tweets. There was lots of great content for #InternationalWomensDay. Dog’s Trust are raising awareness of dog theft with their Family Pawtrait campaign. This from Jenny Pennington at Shelter is important – How to talk about your beneficiaries well. Why you shouldn’t say Thank You by fundraiser Nikki Bell. How to solve the wrong problem – Kate Brennan looks at CRUK’s OB_S_TY campaign. Complexity bias: why we prefer complicated to simple by Farnam Street. Stephen Fry’s message about prostate cancer spurred me on to get checked (HuffPost) or why public information doesn’t work. Here is the video announcement from Stephen in case you didn’t see it. If you are looking for an antidote to giant cheque pictures (just say no), take a look at this video from RNIB supporters in Peebles, Scotland or these golden shiny balloons for CLIC Sargent. In a recent flurry of #CharityJobs, this one stood out. Rosie Downes of Crisis shared 5 reasons to apply. Is your password in the top 500 list (Information is Beautiful)? Best change it if so! Also, catch up with the slides from CharityComms’ content strategy conference and read Eleanor Dean’s blog with her key takeaways – Three thoughts on creating better digital content for your charity. 7 ways to prepare for inevitable digital platform changes – how to stay ahead of the game by Ben Matthews on CharityComms. Why we are actually loving the new Facebook algorithm – Julia Kirby-Smith of RightsInfo on Charity Comms. What does it means for communicators if we #deleteFacebook asks Albert Freeman on Comms2Point0. Post Cambridge Analytica, Luke Williams looks at ethics and asks Micro-targeting and Psychographic segmentation – what are we happy with? And this thread by @SaraDannerDuki is a good explainer about the story. Making content to fit a trend – the best how-to videos as curated by Magneto Films. Have you read the Charity Digital Skills Report? How you does your organisation compare? Do you have a digital strategy? Do your trustees ‘get’ digital? I went to the DigitalAgenda Impact Awards and heard about lots of brilliant Tech for Good projects. Here’s a blog post from Ross McCulloch about some of the winners (4 examples of digital innovation) and a blog post about the Citizen’s Advice case management system which won an award. Is tech for good on your radar? Are you working on projects or know who is in your space? Ten things I wish I’d known 10 years ago – John Slack shares his experience of digital in museums. 5 things we learnt from rebranding and rebuilding our website by Anna Chapman of The Bike Project on JustGiving. SCVO’s new website – what we’ve learnt so far. The organisation moved from a static content site into a data-driven platform integrated with back office systems and feeding to and from external sources. Making public sector websites age-friendly – a useful reminder about accessibility on Digital Leaders. A SEO PR primer by Stephen Waddington. Tipping Point: Agile procurement is in a precarious position as Waterfall looms large by Dominic Campbell of FutureGov. Prototyping – how to learn just how bad your ideas are by Tom Barrett. Digital design principles for the UK charity sector by CAST. Top tech trends for charities in 2018 by Lisa Hornung at NCVO. Why charities need to embrace voice assistants on Macmillan’s digital team blog. Includes examples from Comic Relief, British Red Cross and Arthritis Research UK. See also Breast Cancer Care’s taking care of your breasts tool. 5 ways charities are using VR on Charity Digital News. Includes lots of examples. Also read the BBC’s blog on what they are doing with VR. 22% of searches start in Google Images, how can you optimise your content? The rise of visual search. 10 breakthrough technologies 2018 by MIT. Why the local pound matters – How Preston took back control. Small change, big difference – Karl Wilding looks at the importance of micro donations. almost as good as the sound of ice being dropped 90m down a borehole. Weee! What were your good reads in March? Please do share. Did you miss Jan/Feb’s round-up? Catch up with more good reads! More than ever today, my timeline is wonderfully filled with messages celebrating brilliant women and highlighting women’s projects and causes. It is International Women’s Day (#IWD2018) so here’s my pick of the top content around. Bloody Good Period encouraged us to give a sister a leg-up by donating to their Amazon wishlist. Richard Herring did his annual ‘Why isn’t there an International Men’s Day?’ response marathon to raise money for Refuge. At one stage during the day, new donations were being every added every ten seconds. The £50k target was hit around lunchtime, and £100,000 by the early evening. The final total is now almost £150k + Gift Aid! There were lots of fundraising activities on the day. This reproduction of this suffragette poster from 1906 is being sold to support the campaign for a statue of Mary Woolstonecraft. The Huffington Post ran an article about donating to women’s charities. There are thousands of tweets giving shout-outs to fabulous women. Imandeep Kaur’s thread, showcasing women in her life stood out. Using one tweet per person and a stonking photograph, she explains what the woman has achieved and why they are amazing. Lots of charities celebrated their women founders and / or the stories of prominent women. For example, see Sue Ryder, The Woodland Trust, Leonard Cheshire, RSPCA, Maggie’s Centres, Battersea Dogs and Cats and British Red Cross. And there were a number of posts introducing some of the women I admire working in the sector today. See CharityJob’s Sheroes, Kirsty Marrins’ post from last year and Lightful’s 6 phenomenal women leading the way. City, University of London asked why there aren’t more expert women featured on the news with this nifty animation they shared on Twitter sharing research from Professor Lis Howell. The NY Times admitted that its obituaries have been dominated by white men. They have responded with a series called Overlooked. UNICEF produced this simple animation calling on a world where every woman and girl feels safe. It’s worth watching the #FreedomForGirls video produced by Global Goals if you haven’t seen it already. This interactive timeline of women’s rights and gender equality over the past 100 years from Southbank Centre has been released as part of their WOW festival. Great coverage for this Women in Sheds Age UK project in Loughborough. Some charities you wouldn’t particularly expect to have an story for IWD, used the opportunity to share stories about their work. For example Dog’s Trust shared information about their Freedom Project. And Crisis shared research about the impact of homelessness on women in a short video. ‘Be a role model for the sort of woman you want your children to be’. Wise words in this video from Age UK showing a discussion between Shirley Meredeen and Lynne Ruth Miller. Grow old disgracefully – I love this from the Campaign to End Loneliness. This was just a small fraction of all the tweets, videos, campaigns shared for IWD18. What did you see or produce which particularly stood out? Do share your highlights in the comments. Mandy Johnson made a Twitter Moment of Richard Herring’s International Men’s Day reply tweets.